Remember Colter Bean? I do, all six feet, six inches and 250 or so pounds of him. 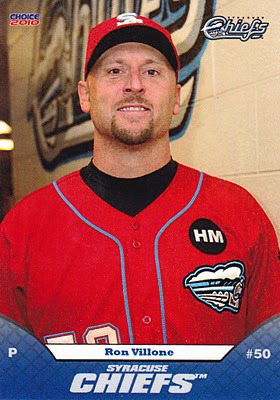 He was a right-handed pitcher from Alabama who went un-drafted after completing his collegiate career in 2000 and was then signed by the Yankees as an amateur free agent that same year. During the next five seasons, he developed into one of the potential “Mariano Rivera successors” in the Yankee farm system. The problem with that of course was that Rivera was like the Energizer Bunny, he just kept going and going and going and didn’t require any successoring. So Bean kept pitching well out of the pen for Yankee farm teams, putting together a 38-20 record with 16 saves, while getting three brief trials with the parent club. Unfortunately for Bean, he didn’t impress anyone in any of them and ended up getting released by New York in 2007, when he was already 30-years-old. The Braves signed him and a year later, so did the Rays, but he would never again pitch in a big league game. Too bad, because I thought Colter Bean had one of the coolest names in Yankee franchise history. Its a name you can’t forget. I never have. He shares his January 16th birthday with this bird-flipping former Yankee pitcher, this one-time Yankee first-baseman and DH and this former Yankee reliever. Johnny Sturm was not your prototypical Yankee starting first baseman. He was instead, a singles hitter. In fact, no Yankee starting first baseman in the history of the franchise ever had a slugging average lower than the .300 figure turned in by Sturm during the 1941 regular season. Lou Gehrig had set the impossible-to-fill mold all future Yankee first sackers would be measured by. Babe Dahlgren, the Iron Horse’s immediate successor had not hit more than 15 home runs or averaged above .264 during his two seasons in the position. Meanwhile, Sturm was hitting well over .300 and averaging 180 base-hits per year while playing first base for the Yankee’s farm team in Kansas City. At the end of New York’s 1941 spring training camp, Yankee skipper Joe McCarthy made the decision to put Sturm and two other infielders from that Kansas City farm club, second baseman Jerry Priddy and shortstop Phil Rizzuto on the Yank’s Opening Day roster. With an outfield full of home run power (DiMaggio, Henrich and Keller would each hit 30 round-trippers in 1941) plus Joe Gordon, Marse Joe figured any of these rookies and maybe even all three would be perfect table setters for the Yankees’ big bats. The plan seemed reasonable but during the season a couple of hitches emerged. After getting the Opening Day start at first, Sturm was quickly benched so that Joe Gordon could move to first and McCarthy could play Priddy and Rizzuto together in the middle of the Yankee infield. But Priddy could not get himself untracked at the plate and by mid-May, “Marse Joe” had moved Gordon back to second and was starting Sturm at first. Almost immediately, Sturm went on an 11-game hitting streak and by the end of it, McCarthy had moved him into the leadoff spot of the Yankee lineup where he would remain for the rest of the ’41 season. Like Priddy however, Sturm also struggled with big league pitching, averaging just .239 during his rookie season. As a result, he scored just 58 times in 568 plate appearances. Despite that poor showing, McCarthy stuck with his punchless rookie in that year’s World Series and the then-25-year-old Sturm came through with a .318 average in the Yankees’ victory over Brooklyn, hitting safely in each of that Fall Classic’s five games. So why did McCarthy stick with Sturm’s inefficient bat at first instead of giving Priddy another chance at second? After all, Phil Rizzuto always insisted that Priddy was a much better ballplayer than the Scooter was and could do everything well on a baseball field. From what I’ve read, it seems Priddy was a very cocky kid who thought nothing of mouthing off at his veteran Yankee teammates and vocally insisting he was as good as or better than most of them. Such brashness, especially from a rookie, did not sit well with his teammates. As a result, few if any of them showed any sympathy or offered to help Priddy with his offensive struggles, while reacting in the exact opposite way with the much more likable Sturm. I’m sure McCarthy realized all this and kept Priddy on the bench in part because he didn’t want to antagonize his veteran players. 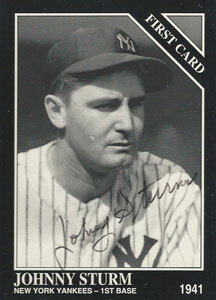 Sturm’s very good 1941 postseason performance convinced most Yankee observers that he would be back at first base come the following season, but two months later, Japan attacked Pearl Harbor. On January 13, 1942, Sturm became the first married big league ballplayer to be drafted into military service. He spent most of his time in the Army playing baseball but he also was part of a detail that built baseball fields on army posts. While driving a tractor on one such detail, Sturm was involved in an accident that resulted in the amputation of two fingers on his non-throwing hand. When he tried to rejoin the Yankees in 1946, that injury destroyed his chances at being successful. Instead, he became a player-manager in the Yankees farm system and one day in 1948, while serving in that role for New York’s Class C Western Association League franchise in Joplin, Sturm’s phone rang. A father of a high school player was calling to request a tryout for his son. Sturm listened to the voice on the other end of the line tell him why this kid was worth looking at and was convinced enough to place a call to Yankee scout Tom Greenwade and arrange a tryout. The name of the dad who called Sturm that day was Mutt Mantle and the rest is Yankee history. This one-time All Star closer and this former Yankee number 1 draft pick were also born on this date. It was just before Christmas in 2007 that former US Senator George Mitchell held a press conference at New York City’s Grand Hyatt Hotel and announced that steroid use was rampant and widespread in Major League Baseball. His report indicated that the Yankees were among the biggest abusers. He listed the names of twenty current and former Yankee players who his investigation had discovered evidence had used the performance enhancing drug. In minutes, that list of Bronx Bombers found its way on to every Web site of every New York City newspaper. Yankee Universe went into collective shock. Yankee stars who had made significant contributions to the four World Series Championships and numerous postseason appearances the team had achieved in the previous decade were on that list. If Andy Pettitte, Roger Clemens, David Justice, Gary Sheffield and even Chuck Knoblauch and Mike Stanton had used the juice that meant the Yankee teams they played so well for and the wins those teams accumulated were tainted. As I reviewed the list, it became clear to me that the players who took PEDs did it for different reasons. Superstars like Clemens, who’d already made their millions did it because they loved the ride they had at the top of their profession and didn’t want it to end. Several on the list, including Pettitte claimed they used the drug to help them recover from injuries faster. But than there were players named on that list like today’s Pinstripe Birthday Celebrant, Ron Villone. He was an aging journeyman pitcher who had been in the big leagues since 1995. 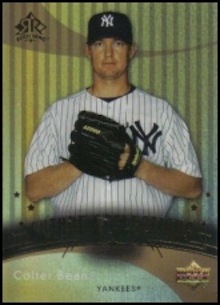 When he put on the Yankee pinstripes for the first time in 2006, two seasons before the Mitchell Report was released, it was the tenth different uniform he had worn in his Major League career. He would get to wear two more different team jerseys after he left the Yankees and before he was released by the Nationals in 2009. Except for three seasons with Cincinnati, he had been a mostly under-the-radar bullpen pitcher with most of those ball clubs. Villone was not a star or a stopper. He kept working because he threw left handed and every big league team at one time or another is looking for a left handed relief pitcher who can come into a game on short notice and get a left handed hitter in the opposing lineup out. In order to do that, situational southpaws like Villone had to stay ready. That meant frequent warming up in the bullpen during games. When you add up all the pitches situational lefties like Villone threw in the bullpen and during games and you add in the fact that he was 36-years-old when the Yanks signed him, its easier to understand why Villone would take steroids. That first year with the Yanks in 2006, Joe Torre used him in 70 games and probably warmed him up but didn’t use him in four dozen others. That’s what Joe Torre and loads of other big league managers did and do to their situational relievers. In order to survive in that role and earn the one-to-two million dollar salaries good one’s get, you have to be ready not only when needed but also when the skipper even thinks you may be needed. Villone probably used steroids to help his 36-year-old arm get ready fast during just about every game the Yankees played. But unlike Clemens or Pettitte or A-Rod, Villone won’t have to worry that his use of PEDs might keep him out of the Hall of Fame. Villone shares his January 16th birthday with this bird-flipping former Yankee pitcher , this one-time Yankee first-baseman and DH and this other former Yankee reliever. 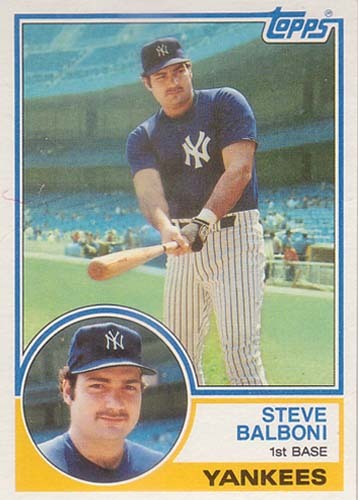 I was always a fan of Steve Balboni. Show me a power-hitting paisano in pinstripes with a great nickname and I guarantee I’ll love the guy. Balboni’s nickname was “Bye-Bye,” given to him in recognition of how far and fast squarely hit balls would travel off his bat. The Brockton, MA native was born on this date in 1957. He got my attention during his minor league years in the Yankee farm system by hitting 150 home runs over a five year period. The Yankees needed right hand power back in the early eighties and I thought Balboni would be a star in the Bronx. But by the time he was ready for the big leagues, Don Mattingly had claimed the Yankee first base job and Dave Winfield was providing the right-handed long-ball bat the team needed so Balboni was shipped to the Royals. As he had done in the minors, Bye-Bye averaged thirty home runs a year during his four year stay in Kansas City but he also struck out about 140 times a season. The Royals released Balboni early in the 1988 season, he got picked up by the Mariners and then released by Seattle at the end of that year. As fate would have it, that spring the Yankees announced Dave Winfield would miss the entire 1989 regular season because of a back injury. New York needed to find a right-handed bat to put behind Mattingly in the batting order. They chose Balboni. Steve’s second tenure in pinstripes lasted two seasons. He hit 17 home runs in each of those years but when he averaged just .192 in 1990, the writing was on the wall. Steve was released on the final day of the Yankee’s 1991 spring training season. Even though his Yankee career did not turn out to be what I had hoped it would, I remember still feeling bad when New York said so long to Bye-Bye. Balboni shares his January 16th birthday with this former Yankee starting pitcher, this former Yankee relief pitcher and this one too. The New York Yankee team of 1994 was 6.5 games ahead of second place Baltimore in early August of that season, when Major League baseball players walked off the job to begin what would become the longest strike in League history. That Yankee team had a starting pitching staff of Jimmy Key, Jim Abbott, Melido Perez, Terry Mulholland and Scott Kamieniecki. So even though I was disgusted with both the players and the owners at that time, I do remember being slightly excited when I learned the Yankees had acquired the 1993 AL Cy Young Award recipient and two-time twenty-game winner, Jack McDowell, from the White Sox in December of 1994. They called the lanky right-hander “Black Jack” and he was one of those free spirits that graces the game every now and then. He was a grunge musician. He was never happy about his contract and he could care less what anybody said about him and that included Yankee fans and the cannibalistic Big Apple Sports Media. This explains why, when he was lifted after getting bombed in the second game of a mid July double-header against his old team the White Sox, McDowell flipped the bird to booing Yankee Stadium fans as he walked back to the dugout. He actually had a decent season in New York, leading the staff in victories with 15 and shutouts with 2. But his pinstripe future was sort of sealed when he gave up the walk-off two-run double to Edgar Martinez that knocked New York out of the 1995 playoffs. His middle finger and his lack of postseason success convinced the Yankee front-office that they could afford not to offer McDowell another contract and he ended up signing with the Indians. Also born on January 16 is this former Yankee with the nickname of “Bye-Bye,” this former Yankee reliever and this one too.